Network mapping: how networks can be mapped and analysed? The first thing to be said is that a network is not just a list. The term implies a set of connections between its members. These connections may consist of the flows of information , power, money or whatever but the implication is that an influence of some sort is passing from one to the other. Thus, a network of 10 members has a total of 45 possible connections. The density of a network is measured by comparing the number of actual links with the number of possible links and expressing this as a percentage. For all members of a network to be connected to it the number of links must be at least n-1. A well connected organisation will have a density of around 15% to 20%. Research shows that the best connected organisations allow its members to connect within two steps – ie that influence drops off sharply if it has to exert itself through more than two connectors. The exception to this is a strongly hierarchical organisation with well defined chains of command. perform according to a number of different measures. 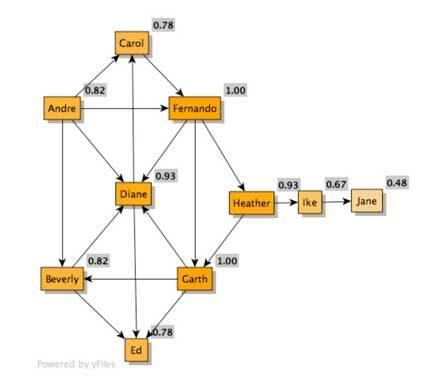 This shows an assessment of how many connections members have. This is known as “Degree centrality”. Diane has more connections to other members. Garth and Fernando are also well connected. Jane is the worst connected person in the network with only 1 connection. Influence over a network is not just a matter of how many connections you have. You may be connected to many people who have few connections to anybody else. Although degree centrality is easy to calculate it doesn’t tell the whole story. This shows how close various members are to all the others. 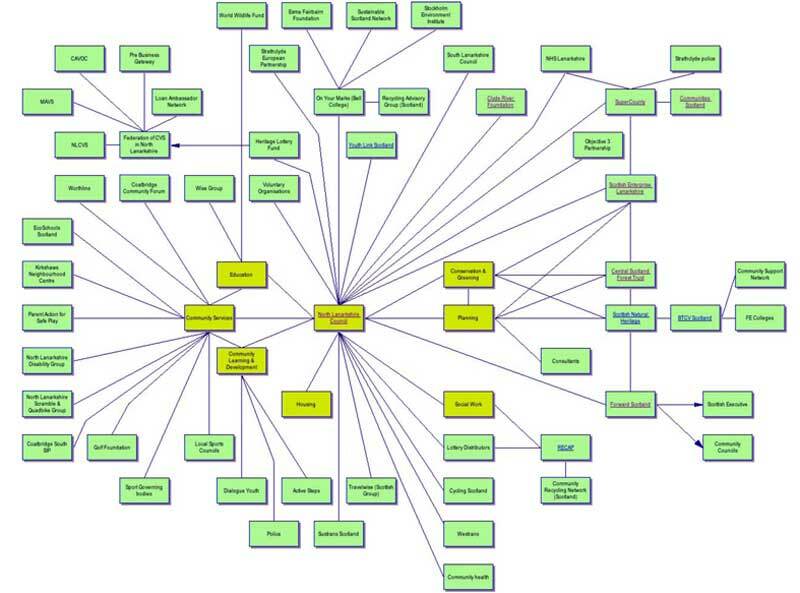 This is measure of how central a person is to the workings of the network. Both Fernando and Garth are within 3 connections of all other people in the net. 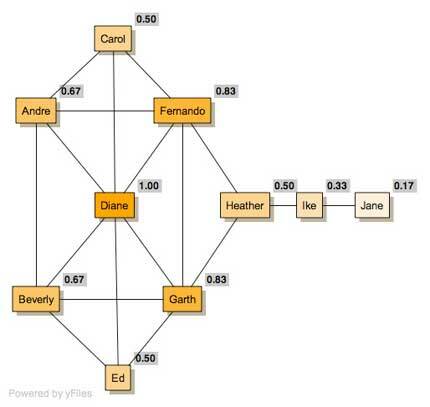 Diane is still central but is 4 connectors away from Jane. This measure is important because research in organisations shows that influence fades if you need more than 2 links to get to another member. It also indicates which members will have general influence over the network because of their position. If you want information spread fast, feed it to the most central members. organisations in this position can have great influence on the flow of information. This is good in that they ensure that the network is fully connected – but potentially harmful in that they can filter that information according to their own agenda or make the network vulnerable to their departure. 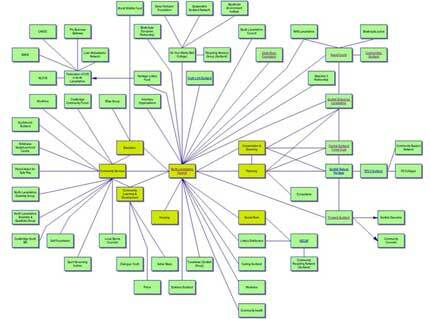 So how can we use network mapping and analysis to help our regeneration activities? We have been involved in a number of projects that have used such mapping. As part of a learning programme for Departments involved in Public Engagement, we asked participants to list the three organisations that they worked with most. These had to be operational links – sitting on the same committee didn’t count. 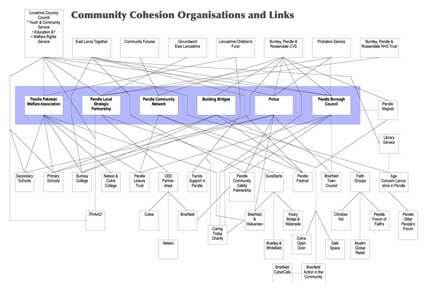 This map is now being extended to show a wider range of organisations and to provide a “road map” for those concerned with public involvement. Shading shows organisations with the greatest betweenness centrality. The map below was developed for a conference on development of a network based on environmental projects. This version was developed before the conference through a short questionnaire. A session in the conference further developed the map and this was used as a the basis for analysis that showed the existing and potential centrality of the local authority in developing the network – but also the shortcomings of links within the authority itself (yellow nodes). This map was prepared using a series of interviews and leaving a basic map for completion by the interviewees. The subsequent analysis revealed a series of local “broker” organisations that acted as intermediaries between regional organisations and local projects. These are shown against a blue background and are totally connected – ie all brokers link with all other brokers. 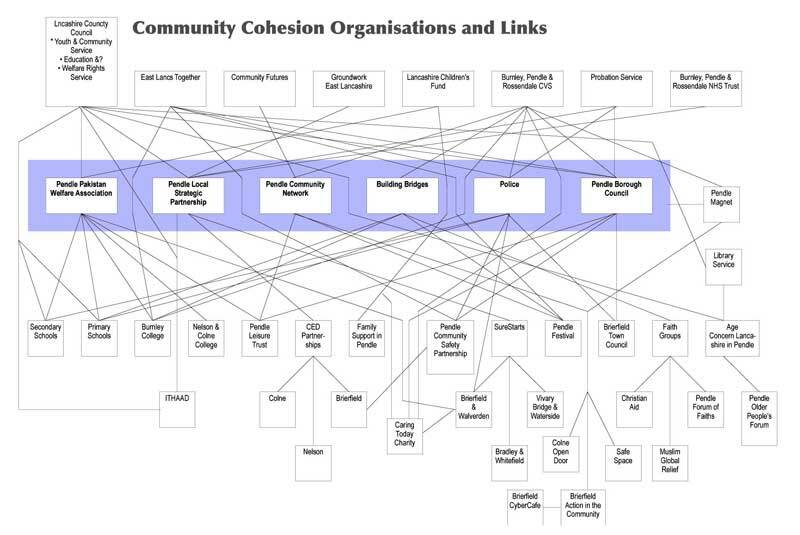 The network is particularly well connected compared to some other community cohesion networks in Lancashire. 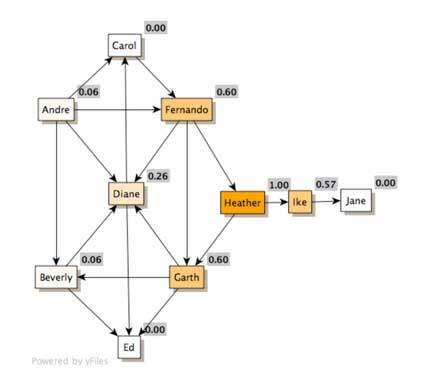 As can be seen from the above examples, mapping can be a practical tool in defining a network and making some assessment of its likely performance. It is a well recognised technique that can uncover some unexpected issues and opportunities. Simple networks can be analysed visually. Networks of any size will need computer support in drawing the simplest diagram and in analysing the various forms of centrality. Maps can be used as “clickable” way finders on the internet. Each node can contain a web address that leads to an organisation’s website.